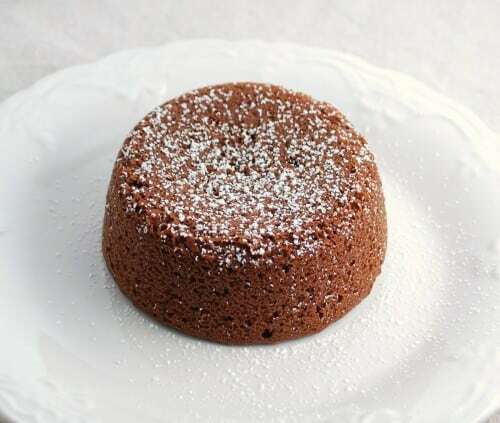 Some people call this chocolate molten cake, some people call it chocolate lava cake. I call it a little piece of heaven on earth. And I am wondering to myself why the heck I didn’t try it out before now! It is so simple to make, tastes incredible, and is sure to wow your guest. Well, at least it wowed my four boys and hubbie. They were quite impressed when they cut into their cakes and saw all the yummy chocolate gooey-ness oozing out. But then you cut into it. Holey baloney, does that look fantastic or what? Butter 6 ramekins or custard cups. Put chocolate and butter in a large glass bowl. Melt in microwave at 50% power, stirring every 30 seconds till smooth. Whisk in powdered sugar till thoroughly combined and melted. Whisk in eggs and yolks. Stir in flour. Divide batter between the 6 ramekins. Place on a cookie sheet. Bake in a preheated 425° oven for 13-14 minutes. Center will still be slightly jiggly. Let stand for a couple minutes, then invert onto small plates. Serve with whipped cream or vanilla ice cream. I can´t wait to try this out. What size of ramekins do you use? Since I don´t have any, I have to get some and would love to know the best size. Mine are between 3 1/2-4″ wide. I think any size between 3-4 inches would work just great. Can these be made in muffin tins? Can these be made in advance, or do they need to be eaten the same day? If not, how can / do you store these? My friend makes similar cakes and freezes them. She freezes them on a cookie sheet first then puts them in a gallon freezer bag. They thaw quickly and are yummy if reheated. 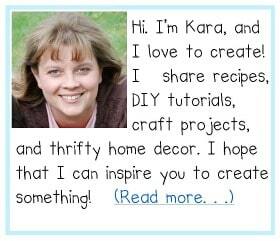 This looks amazing Kara! Thank you so much for sharing this with us. Delicious! This is not helping my diet plan!! haha! I cannot wait to bake this baby up! 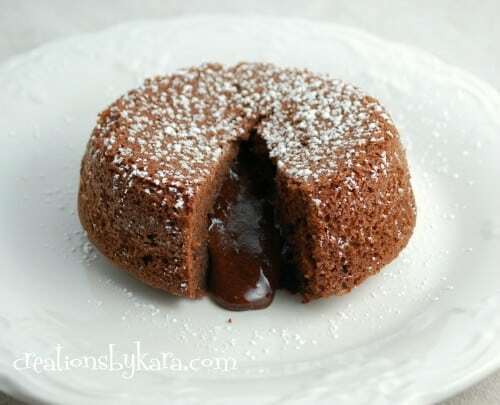 I LOVE chocolate lava cake!! And I would love it if you linked this up to my party!! Wow- this looks absolutely delicious! I saw this on Oopsey Daisy and I’m your newest follower! I LOVE your recipe! Would you come over to CAST PARTY WEDNESDAY and share this yummy recipe with us? YUM! I have been wanting to make this kind of cake- now I REALLY want to try it. Looks incredible! YUMMMMY!!! I can’t wait to make this. I’m a chocolate addict and love ooey, gooey desserts. Thanks for the recipe!